The article is about Things to do in Baguio City Philippines. It was actually originally intended for TripTipping but then again, I needed to write a completely new material because of site formatting issues. They have a specific guideline for articles published at TripTipping. But at least, even if the article didn’t work for one site, it worked for another. 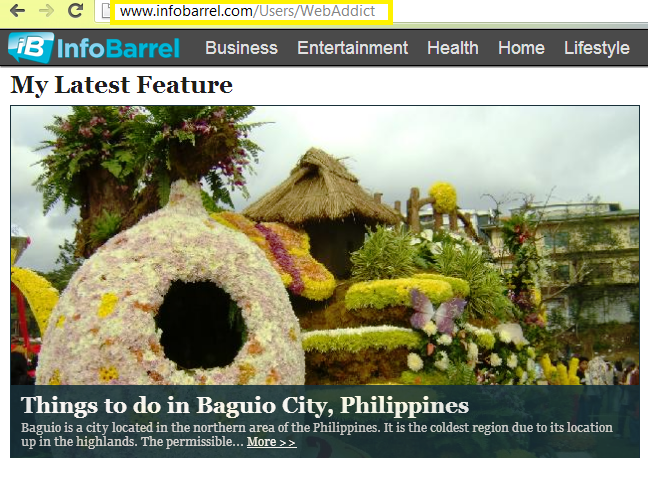 InfoBarrel or IB by the way is one of the fastest growing revenue sharing content sites. Its revenue share is relatively larger as compared to other sites. Hubpages, supposedly the number one and has a distinct system for earnings, is in trouble for content with duplicate and link issues. Squidoo, also another gigantic platform pays based on your article’s rank. 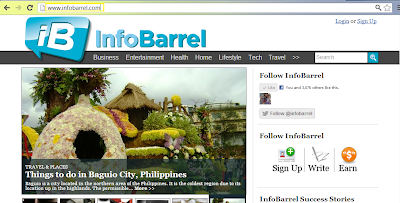 More information about InfoBarrel is available on this post Building a Passive Income through InfoBarrel. Featured articles are selected based on a submission process. Only articles written and submitted on the current month can be submitted for possible selection among featured articles for the following month. I published the above article in February and it was chosen as one of the editorial favorites for March 2013. To be selected, the article must follow specific guidelines to stand out. Not to mention stand out against possible hundreds of other articles also submitted as a feature. The number of featured articles for a month will be dependent on the number of days per month. Two for each day will be featured. Every day will have an assigned category and topic. If your published article falls under any of allotted topics, then you can have it submitted for consideration. Among all submitted articles, featured submissions will be chosen by the editorial board based on featured content guidelines imposed. If you are already a member of the site, having your articles featured means additional exposure. The article will be posted on the home/front page of IB along with other selected pieces. It will be among the posts with thumbnails and enlarged image shortcut/link to the article for 3 days and 6 more days below the thumbnails. Through this, you will naturally have greater chances of seeing visitors, especially first timers, read the featured article. They may even read your other articles and check your profile page. You can use the latter to link back to your site, blog, or any other profile/page you have online. You may even offer your services in any field related to the articles you have published. Also, traffic to your articles, profiles, etc. may be converted into generated income of course. Anyway, even if your article is not featured, you can still take advantage of the site’s page rank for views. IB is currently a PR4. I’ve reviewed my earnings for the past year and found out that it’s almost at par with what this blog (Free Minds Free Lines) earns. That’s actually amazing considering the fact that my IB account has less than 100 articles. I also don’t pay for a domain name and I don’t exert as much effort as I do for this blog. By the way, if you haven’t joined InfoBarrel yet, you can do so under my referral link. I may not be a pro on the site yet but I’d be glad to share what I know. Join InfoBarrel here!